Director: D. Gasyuk, B. Golovnya, Gasyuk D., Parent B. Script writers: Belokurov L.; Kemarskij N.
Portrait Shneyderova VA The director's console in the studio during the program "Club kinoputeshestvy" Shneyderova portrait on the monitor screen. View desktop office Shneyderova, glasses and a typewriter on the desk. Photos Shneyderova and souvenirs from foreign countries, a variety of masks on the walls of the cabinet. Portrait Shneyderova in his youth. Newsreel, 1917: buildings and streets of Moscow after the October fighting in 1917. The street is a detachment of Red Guards. Views of Moscow streets in the early 1920s (above). View of the Grand Theatre, the city and horse-drawn carts on the streets of Moscow. Interior view of the assembly hall film studio, women are working with a film of the timelines. The process of installing and splicing film. The audience in the cinema hall, on the screen approaching train. Aircraft on Khodynka airport before the flight from Moscow to Japan in 1925. Schneider and other trip participants board the plane. The pilots of one of the aircraft before departure. The first aircraft was taxiing to the runway, people wave goodbye hands. The pilots in the cockpit, the passenger's face. View from the top area. Shneyderova person looking out of the window. Meeting and filming participants in Krasnoyarsk flights. The crew of one of the aircraft. One of the pilots - MM Gromov It stands at the aircraft. The participants of the flight after landing in Mongolia. Choibalsan H. speaks with members of the flight. Type one of the streets of Ulan Bator, the people passing on horseback. Powered telegraph, telephone operator on the switch. Soviet aircraft landing in China. Greeter Chinese aircraft take off hats and bow. G. Blum operator is shooting. View of Shanghai street, a policeman at the intersection, cars and rickshaws on the streets. A homeless man sleeping on the sidewalk Rickshaw lucky rider. Sailors at the gates of a foreign mission. American warship in the port. Rally in honor of the Soviet-Chinese friendship, he spoke. Filming expedition to Pamir in 1928. People and horse slide down the snow slope. View from the hillside climbing expedition on the trail. Those leaders of the expedition O. Schmidt, DI Shcherbakov, Gorbunova. Newsreel, 1928: O. Schmidt during the Pamir expedition. Geologists jump over ice crevasse. Members of the expedition are on the glacier, one of them fails. People go through the ice field, up the hill on the ice. View the bow deck of the icebreaker "Siberians", a person standing on the bow of the icebreaker. Broken ice behind the ice-breaker, "Siberians" goes through the ice of the Arctic. Captain Vladimir Voronin on the bridge of the icebreaker. Ernst E. radioman aboard the icebreaker. Schneider and Schmidt on board the icebreaker. Installing cameras on a tripod on the deck of an icebreaker, Shneyderov sends a signal to start recording. Polar bears on the ice floe. Arctic landscape, the polar ice caps. Icebreaker, nipped in the ice, the team splits the ice at the sides of the vessel. Schmidt confers with members of the expedition. Team members carry sacks of cargo for lifting the stern of the icebreaker. Shneyderov takes a sack on his shoulders. An emergency operation on board the icebreaker. View of the stern of the icebreaker, raised above the ice. General view of the ice-breaker mounted with a rigged. The expedition members salute from the guns after the icebreaker to clean water. Panorama of the coast of the Bering Strait. Portrait Shneyderova during the expedition. Images from the feature film Shneyderova "Golden Lake", Altai taiga species and landscapes. Owl on a branch, dancing shaman bandits. Images from the x / film "Djulbars" fight footage Basmachi. 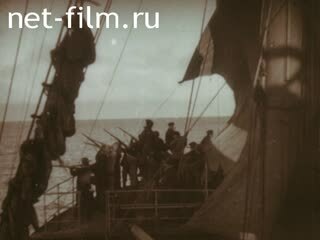 Newsreel 1941: Shneyderov during filming in the Volga Delta, the birds fly. German planes bombed Soviet cities, the burning building. Newsreel, 1942: panorama of the burning banks of the Volga at Stalingrad. German tanks in the offensive. The calculation of the anti-gun fires burning German tank. Anti-tank artillery fires on German tanks. View of the river, the forest on the banks of the hand (above). Portrait Shneyderova interiors Shneyderova cabinet. Glasses on the table, graphic portrait Shneyderova. Newsreel 1957: cars travel through the mountain-desert area. Shneyderov during the filming of the movie "Under the sky of ancient deserts." Members of the crew at work. Domestic species Thousand Buddha Caves in China, Shneyderov is filming in a cave. Shneyderov during filming in China. One of the halls of the Museum of Tsentrnauchfilm. Prizes and awards for the best films of the geographical. Medal Lomonosov Prize, which was awarded the Schneider. Newsreel 1969: Assignment Shneyderovu title of People's Artist of the RSFSR. Shneyderov talks with members of the expedition in 1928 and Academician Shcherbakov. Photos Shneyderova during his work on the program "Club narrator." ID Papanin gives interviews (synchronously). Newsreel 1950: Shneyderov discusses the creation of a new movie, a person Shneyderova. The film is about the life and work of Soviet film director, traveler, the founder of the club kinoputeshestvy television, People's Artist of the RSFSR Shneyderova VA In the picture included newsreels: 1st flight to Japan through Siberia, Mongolia, China in 1925, climbing to the Pamirs, the icebreaker "Siberians", etc.